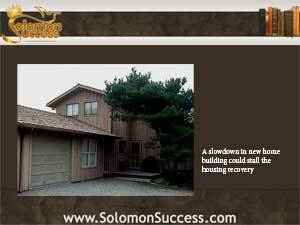 Solomon Success > Blog > New Home Construction: Slowing the Housing Recovery? As the wise King Solomon knew, building homes and other dwellings connotes prosperity and stability. “Wisdom hath build herself a house, she hath hewn her out seven pillars” he says in Proverbs 9:1, and the construction of his great temple is lavishly detailed in the Book of Kings. In both Solomon’s day and our own, building is a pillar of a prosperous economy. For that reason, some housing industry watchers worry that the current slowdown in new home construction could jeopardize the housing recovery. Housing demand is rising, so why the stall in construction? The problem, say industry experts, lies with lenders, as it has all along. But in this case, the issue is with the commercial loans for the acquisition and development of land, followed by the construction of new homes. This funding supports commercial contractors and is not offered by all lenders.